So, you want to be a dancer. We don’t blame you. Dance is one of the greatest forms of human expression, and it’s just plain fun! But if you’re not sure where to start your dancing career, Star Bound Dance Company in Airdrie is here to help! 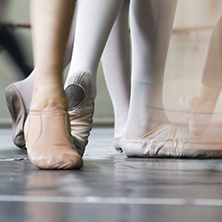 Read our quick guide on things to know to become a dancer. You might be the master of the kitchen cabaret, there are many more styles of dance than simply shuffling your sock covered feet on the tile floor. At Star Bound, we offer many different styles of dance, from traditional ballet to modern jazz and cutting-edge hip hop. With so many to choose from, we suggest taking a minute to familiarize yourself with each of the styles and find the one that gets your feet moving. Once you’ve found a dance style that appeals to you, it’s time to find a dance class that fits your ability level. Don’t be embarrassed if you feel like you have two left feet. Everyone starts somewhere, and there’s no shame in taking a few beginners’ courses before moving on to more complex courses. In fact, even experienced dancers can benefit from beginners’ courses! There’s a class and skill level available for everyone at our dance studio in Airdrie. One of the fun parts about dance is all of the special outfits and accessories that go along with it. But each style of dance has a specific set of shoes and clothes that are worn while practicing and performing. Before your show up to your hip hop class in a tutu and slippers, it’s always a good idea to ask your instructor what the dress code looks like. You might even meet with the shoe specialists at Star Bound to make sure that you get shoes that fit your feet properly. We always invite new dancers to come visit our dance studio in Airdrie before they even start their first dance class. This allows them to meet with instructors and staff, ask any questions they might have, and get oriented to the dance studio itself. It can also give you a sense of the expectations of the course and the instructors so you’ll feel better prepared for your first step onto the dance floor. Like any specialized activity or hobby, there is a whole dictionary’s worth of jargon and phrases that might sound foreign to you at first. It’s never a bad idea to take a few minutes to read over a glossary of dance terms before your first class. While your instructor will explain these terms as they use them, knowing a few beforehand will help you ask more detailed questions about movements and exercises should you have them. At the end of the day, beyond all of the fancy shoes and phrases, dancing is all about having fun and expressing yourself. We firmly believe that here at Star Bound Dance Company, and we’re excited to help you become a talented and graceful dancer. Find out about our class schedules here, and get started today!